It hasn’t been a quiet year in local visual arts. We had our share of blockbuster shows, the welcome return of an affirmational regional survey and plenty of exhibitions that spoke directly to our mid-apocalyptic times. Multiple times during KADIST’s exhibition If These Stones Could Sing, four women performed choreography by the Tel Aviv-based group Public Movement—a tightly coordinated routine that involved crisp white uniforms, a falling wall and a collective gasp from the audience. Part military drill, part dance and completely harrowing, the performance destroyed the controlled environment of its gallery setting, eliciting a pure, thrilling reaction that still makes my breath catch remembering it over 10 months later. 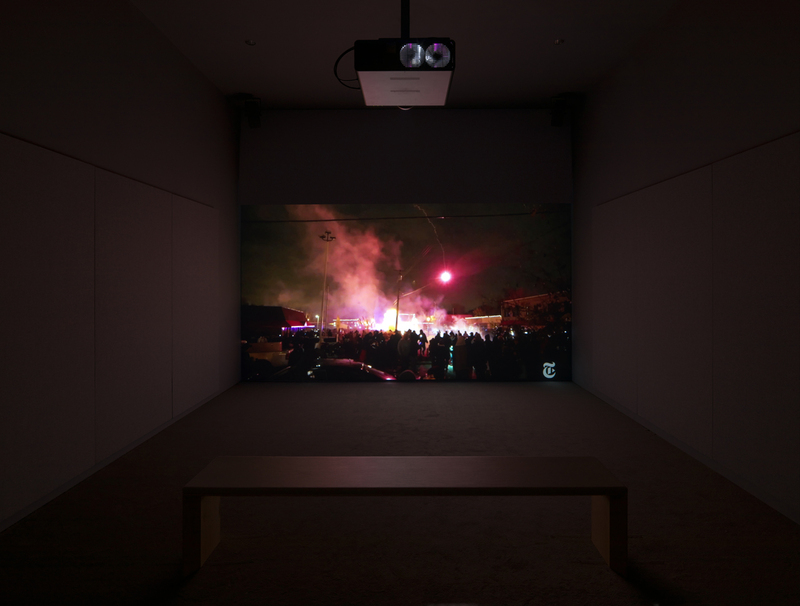 Within the fantastic SFMOMA show Nothing Stable Under Heaven, Arthur Jafa’s seven-minute video, set to the tune of Kanye West’s “Ultralight Beam,” mesmerized viewers with a sequence of clips showing transcendent highs (black performers and athletes), the depths of evil (systematized violence against black bodies), and the ordinary moments of black life between those extremes, both past and present. It is a powerful work of art, but as he’s said recently, perhaps too easily consumed by non-black audiences. His most recent work, commissioned by BAMPFA for their Matrix series and on view through March 24, 2019, shifts focus to representations of white experience. For Jafa, neither black nor white America can be understood in isolation from the other. In late September, as the golden hour approached, a crowd gathered in Recology’s outdoor courtyard, newly filled with a runway made from rough wooden pallets. It was time for the culmination of BONANZA’s three-month residency (a.k.a. artists Conrad Guevara, Lindsay Tully and Lana Williams), a joyful presentation of junkyard fashion made out of Lowe’s bags, shaped foam, dashboard shades and repurposed crocheted blankets. 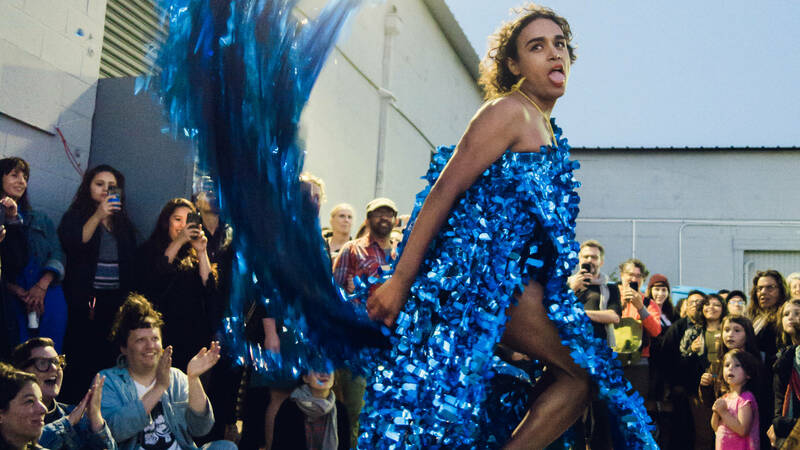 A small army of models (local artists, performers, members of the queer community) served futuristic-recycled-fantasy realness, spinning expertly at the end of the makeshift runway. I cheered so hard I nearly lost my voice. To celebrate the publication of J&L Books’ Where to Score, a reprint of classified ads from the short-lived 1960s counterculture newspaper, the San Francisco Oracle, a small team of young artists led by editors Jason Fulford and Jordan Stein returned to the scene of the crime. The Haight-Ashbury, that is. 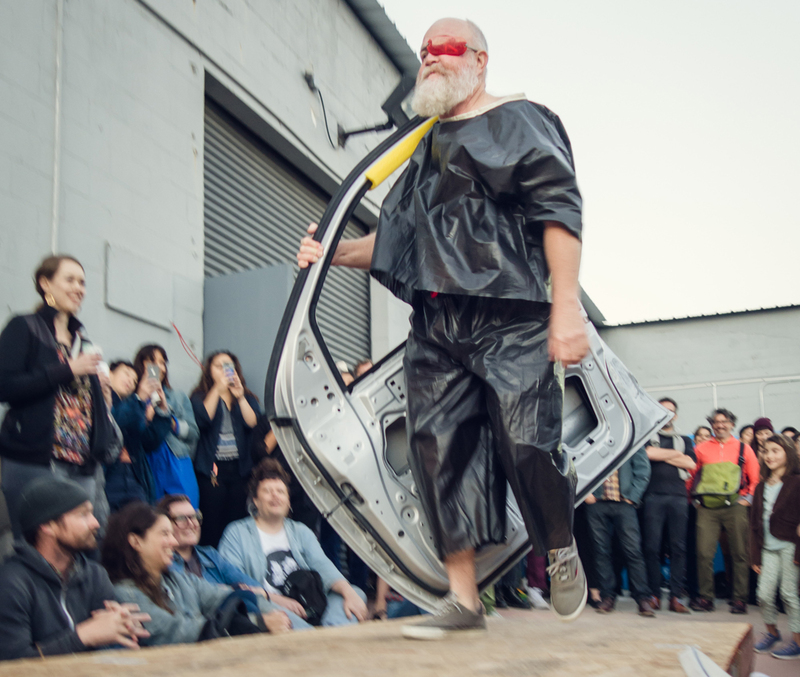 Donning absurd costumes and identities pulled from the pages of the past, the artists became moving targets in a neighborhood scavenger hunt co-organized with KADIST, distributing odd objects (and sometimes hunks of bread) according to their adopted personas. 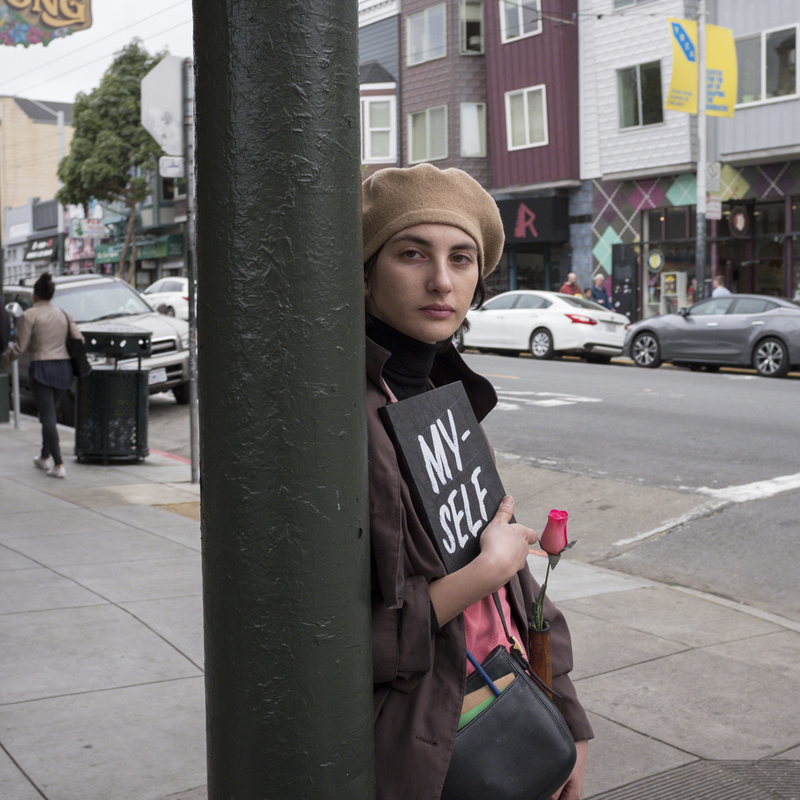 It was just as confusing, hilarious and fun as I imagine Haight Street might have been 50 years before. The night of XUXA SANTAMARIA’s performance of Song4Sanctuary, a sound piece and accompanying dance performance, a few dozen audience members sat on the grand staircase of the mostly empty building—site of protests, history-making marriages, deaths and the ordinary bustle of city bureaucracy. Sofía Córdova and Matthew Gonzalez Kirkland stood above the assembled audience with mix tables and microphone, projecting ethereal, haunting music into the enormous space. 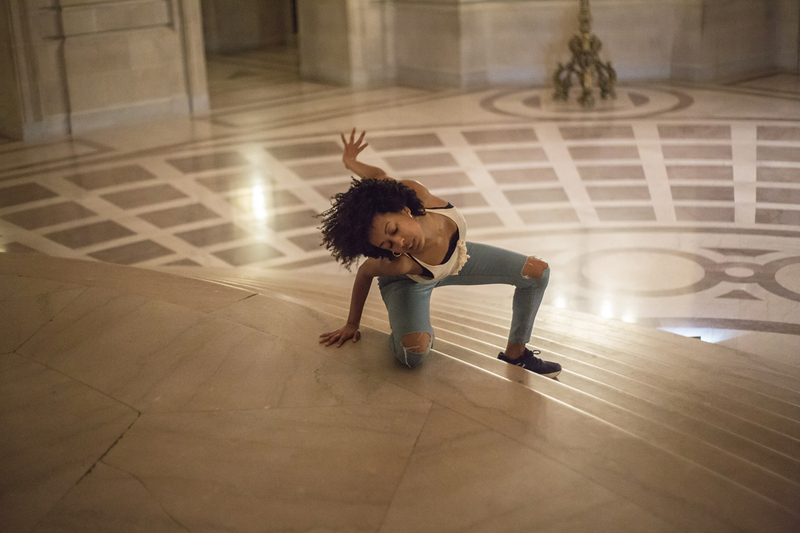 But no one could tear their eyes away from dancer Stephanie Hewett, who moved over the cold stone floor and up the stairs with a frenetic grace that responded to and created shape from the abstracted sounds. In a program intended to address San Francisco’s status as a sanctuary city, Hewett embodied the physical yearning and hope wrapped up in the concept of immigration, all balanced against the monumental architecture and government systems that would seek to bar the free movement of people from one country to another.